Brexit Bulletin: Could Davis Quit? (Bloomberg) -- Today in Brexit: It’s another difficult day for Theresa May as she goes head to head with her Brexit secretary who’s failed to deny rumors he could resign. Not for the first time, the Brexit negotiations are giving Theresa May’s government a serious case of the wobbles. Brexit Secretary David Davis, who’s due to meet his European Union counterpart Michel Barnier on Monday, is said to be furious over May’s plan to keep the U.K. tied to the EU’s customs rules for an open-ended period of time. 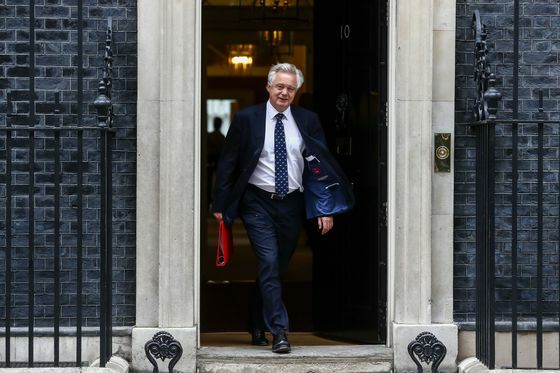 The row has escalated quickly, with Davis and his allies failing to quell speculation that he could quit over the issue, Tim Ross and Kitty Donaldson report. Foreign Secretary Boris Johnson, Trade Secretary Liam Fox and Michael Gove, the environment secretary, also object to the latest version of the customs plan. The Times reports today that pro-Brexit cabinet members were kept in the dark about the plan until hours before it was due to be published, with their allies accusing the prime minister of deception. British negotiators are holding off handing any proposal to the EU while May and Davis argue, people familiar with the situation said. Davis and his fellow euroskeptic ministers are ready to confront May over the policy at a crunch meeting of her Brexit “war cabinet” today. Davis won’t back down ahead of the meeting, although he and May could try to hammer out their differences beforehand, the people said. In Brussels, officials seem resigned to watching the British political drama play out. Many on the EU side thought the Irish border issue had been practically resolved as far back as December, when the U.K. agreed on the need for a solution in the Brexit treaty text. The EU’s ambitions for this month’s summit have been drastically scaled back. Where once, EU officials thought the Irish issue could be put to bed to allow discussions to turn to the type of relationship the two sides want after Brexit, now many see the problem seeping into July and beyond. The Daily Telegraph’s Ambrose Evans-Pritchard argues that the Brexit negotiations show the U.K.’s “dash for independence” has failed. Leading U.K. business groups have expressed fury at the government over what they see as its failure to consult companies over Britain’s post-Brexit relationship with the EU, the Financial Times reports. Successful Delivery | Amazon.com Inc. plans to expand its U.K. workforce by 10 percent this year, despite continued uncertainty over what Brexit will mean for the British economy. The online retailing giant will create 2,500 British jobs in areas from machine learning to customer service, Amazon said. The company added 5,000 U.K. workers last year. Two Halves | Theresa May compromised with Tory rebels by agreeing that the EU withdrawal bill should be heard over two days – Tuesday and Wednesday of next week – in two six-hour sessions rather than in one marathon 12-hour debate, according to the Daily Telegraph. Trade Appointment | The U.K.’s Department for International Trade appointed Mark Slaughter director general for investment. Slaughter, a former Asia-Pacific head of corporate and investment banking at Citigroup, will lead efforts to attract foreign investment. No Change | Britain’s financial regulator said it hasn’t found a durable way of changing the calculation of the risk margin in EU capital rules. The rules don’t appear to be having a detrimental impact on policyholders via annuity prices, Prudential Regulation Authority CEO Sam Woods said in a letter to the U.K.’s Treasury Committee. Norway’s Interests | With all the talk of whether the U.K. could copy Norway’s relationship with the EU, it’s worth hearing Norway’s view. “It’s important that we shall safeguard Norwegian interests, not the U.K.’s interests,” Norwegian Prime Minister Erna Solberg said in interview on TV2. The European Economic Area agreement, which Norway is part of, has to be preserved so that it “works well for our purposes,” she said. Please join our Facebook group, Brexit Decoded, and follow us @Brexit on Twitter.